Break open your piggy bank…. tiny pixels are now for sale « pixels …everywhere. In early July of this year, I wrote about Sifteo in “Tiny pixels in your child’s pocket”. 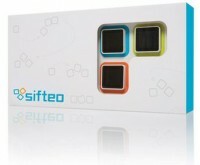 Sifteo cubes are now for sale, but they’re pretty expensive: a starter kit of 3 blocks for $149 with additional blocks at $45 each. You can learn more here.